1. Cosmetic concern – when one finds the moles unsightly or unattractive. 2. Health concern – when the moles could be skin cancer. 3. Cultural belief – when one believes the moles could affect his/her life and fortune. 4. Inconvenience – when the moles appear on areas which cause inconvenience such as neck and groin area. Genetic is the main determining factor. Some people are genetically more prone to having moles. People with a large number of moles are at higher risk of developing skin cancer. Sun (UV) exposure plays an important role in the development of moles. However, moles triggered by UV rays tend to appear later in life. This is why sun protection with sunscreen is important in Singapore. I don’t like my moles. Can I have them removed? Of course you can. There are a few ways to remove moles. But the most important thing is to get your moles assessed by a doctor first. After a proper assessment and diagnosis, your doctor would be able to recommend the safest way to remove your moles. It is not advisable to attempt to remove the moles by yourself, or to get your moles removed by non-professionally trained individuals. 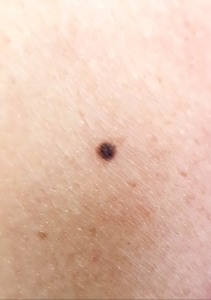 How do I tell a mole from a skin cancer? If you have a mole that changes over time, consult a doctor to get it assessed. You can use the rule of ABCDE to monitor your moles. If your mole has any of these ABCDE characters, consult a doctor immediately. Numbing cream and/or numbing injection is given before any mole removal procedure to minimise discomfort. . Yes, although the severity of scar depends on the type of the moles and the removal technique. Scarring is almost inevitable for all mole removal procedures especially if the moles are big. Scars will improve with time, and can be treated with other ways later on. Mole removal with laser and eletrosurgery will leave a wound at the treatment site, followed by a scab forming after a few days. Scab will fall off after 1 to 2 weeks when your fresh skin grows underneath. Surgical excision will require stitching, which will be removed in 1-2 weeks. In other words, all mole removal procedures have recovery time. All mole removal procedures are generally safe but recovery takes time. Infection is very rare. It is important to let a qualified doctor assess your moles before getting your moles removed. Mole removal procedures in Singapore are safe. If you have moles that are bothering you, give us a call at 62350338 or visit us at S Aesthetics Clinic to consult our doctors.